The permanent exhibits at Wichita museums are world-class and as the largest city in Kansas, we also attract top-notch touring exhibits. From art museums to history museums, there are more than 30 museums in Wichita that will take you to distant cultures, days gone by and the edge of space. All of our museums are affordable and several Wichita museums offer free admission, including the Ulrich Museum of Art (free daily), Old Cowtown Museum (free on Sundays) and Wichita Art Museum (free on Saturdays). Here’s a look at new and upcoming exhibitions at several Wichita museums. Exploration Place is currently working on its most dramatic exhibit renovation since the interactive science center opened in 2000. Design Build Fly is an all-new aviation exhibit that taps into the aerospace leaders and experts in Wichita, known as the Air Capital of the World for its innovation and manufacturing aptitude in the aviation industry. Design Build Fly is scheduled to open to the public on Saturday, Dec. 2 and is included with museum admission. The 5,100-square-foot gallery will include a section exploring the design or engineering process, one demonstrating how an airplane is manufactured and a fly section devoted to the science aerodynamics. Design Build Fly will include dozens of hands-on activities that reveal what happens behind-the-scenes in Wichita’s aircraft plants. Design an airplane seat. Choose a mission and develop a cargo, military or ambulance plane. Test landing gear. 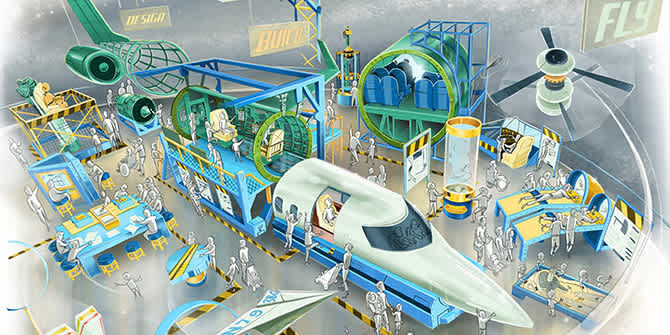 Enter the 10-foot long 737 fuselage theater and experience stories about our local industry. Climb into a luxurious private jet and pretend you’re a superstar or business mogul. Control an unmanned aerial vehicle. Map out a flight path to an exotic destination using GPS. This year’s traveling exhibit at Exploration Place, Hall of Heroes, is on display and will continue through the end of the year. The touring exhibit was produced by Stage Nine Design and features interactive stations that blend science and science-fiction. You can unleash your superpowers and test your skills of gadgets (think a robotic arm that you can control like a claw arcade game) or your agility (think a game similar to “Dance Dance Revolution”). There are also superhero movie props, costumes, memorabilia and rare artifacts, including a replica of the 1966 George Barris Batmobile. Indians in the Arts, opening July 22: American Indians have long contributed to the world of the arts. Through visual, performance, fine and folk, art is ingrained in Native culture and artists continue to adapt and hone their craft today. Elements: Earth, opening Aug. 12: Earth is the final installment of the museum’s Elements exhibit series and will feature the medicine wheel, or circle of life. The medicine wheel encompasses all of the earth and the life within it. Special showing of the Ken Enquist Collection of Chisholm photos to commemorate the 150th anniversary of the Chisholm Trail. Food Traditions, opening Oct. 7: Our relationship to the earth through food culture surrounds many parts of our lives. Many American Indian traditions and rituals center around the gifts received from Mother Earth and the fruits of the land. Native Christmas, opening Dec. 2: This exhibit features an American Indian Christmas tree decorated with handmade ornaments and four separate nativity sets in different American Indian art styles. Located in Wichita’s old City Hall building, topped with a 170-foot-tall clock tower, the AAM-accredited Wichita-Sedgwick County Historical Museum features dozens of exhibits on four floors. Tapping into their collection of 70,000 artifacts, museum officials have created new civics and government special exhibits that are opening to the public in mid-July. The exhibits examine the role of late 19th century government at federal, state, county and local levels. The theme of self-governance with a focus on local issues features artifacts ranging from a Waco Township ballot box of the 1880s and a dashiki shirt worn by civil rights leader Chester I. Lewis in the late 1960s. A new immersive exhibit of the City Hall’s first Mayor’s Office in the original room has been created to interpret the space as it appeared when first occupied in 1892, complete with recreated window signage visible from Main Street. An exhaustive effort researching newspapers, photographs, reports and other records was made to accurately portray the space. The building itself draws many to the Kansas Aviation Museum, housed in the city’s original Wichita Municipal Airport Terminal Building, an art-deco structure built in the 1930s. Inside, you can stand in the same atrium where museum officials say Fred Astaire once danced while awaiting a flight or climb up to the control tower. More than a dozen aircraft are on display outside on the ramp, and inside you’ll find restored aircraft and exhibitions, including a few new displays set to open in the coming months. Look for announcements in August on the dedication of a recently restored Beech Staggerwing and a rededication of a newly updated Kansas African American Aviators exhibit. In November, the museum will add to the its Kansas Aviator&apos;s Hall of Fame and by the end of the year, museum officials expect to unveil a new exhibit of vintage flight attendant&apos;s uniforms. The museum’s fall temporary exhibit is “The Feminine Eye,” an exhibition of photographs by black women photographers that will run from Sept. 16 through the end of the year. This exhibition consists of work by five women photographers: Toni Parks, Shenita Horton, Labeebah Beruni, Chandra McCormick and Pat Patterson. These photographers are locally, nationally and internationally known, and they approach their subject matter in ways that yield very different and creative results. The Wichita Art Museum’s major fall showcase is a touring exhibition from the Smithsonian American Art Museum. “Irving Penn: Beyond Beauty” is on display from Sept. 30 through Jan. 7, 2018, and is the first retrospective of Penn’s work in nearly 20 years. Penn (1917–2009) ranks as one of the foremost photographers of the 20th century, known mostly for his iconic fashion, portrait and still life images that appeared in Vogue magazine. The exhibition is drawn entirely from the extensive holdings of the Smithsonian. On display will be 146 photographs, including the debut of 100 photographs including rare street photographs from the late 1930s and 1940s; images of post-war Europe; iconic portraits of figures such as Truman Capote, Salvador Dali and Leontyne Price; color photographs made for magazine editorials and commercial advertising; self-portraits; and some of Penn’s most recognizable fashion and still life photographs. Also on view for the first time will be Super 8mm films of Penn in Morocco, made by his wife, Lisa Fonssagrives-Penn, that add a vivid picture of the artist at work. WAM also will be unveiling its first exhibition of a recently acquired collection. Opening Oct. 21, “Americana: New Collection Acquisition” will showcase the museum’s newly acquired major collection of Americana, featuring more than 600 objects made over three centuries. Formed by Bellingham, Washington, collector Jack Bernstein and his late wife Irene, starting in the 1980s, the collection strengthens the museum’s prized American art collection. With this single acquisition of an extraordinary collection of Americana, the Wichita Art Museum joins the ranks of other museums that pair rich folk art collections with strong American art holdings, such as the Metropolitan Museum of Art and the Smithsonian American Art Museum. WAM’s collection includes wide-ranging examples of American folk art―from landscape paintings to hunting decoys, shop signs to embroidered samplers. Particularly noteworthy is a group of historic African American cloth dolls. Another highlight is a group of 19th-century portraits by self-taught artists, many with known sitters and artists―a rarity for paintings of this type. Opening Nov. 11 and on display through Feb. 11, 2018, “Surveillance: Who is Watching You?” is an examination of photography’s role in secretive looking from the 1860s to today, using photographs from The Nelson-Atkins Museum of Art. Dating from 1864 to 2014, the works in this exhibition fall under categories of spying/hidden camera, photography of the forbidden, military surveillance, areas of heavy surveillance, and mapping satellites and drones. Also included are examples of counter-surveillance that either prevent watching or surveille the watchers. Houston-based artists Jamal Cyrus and Nathaniel Donnett, and Los Angeles-based artist Rodney McMillian, all share similar approaches to art-making. Using everyday materials such as vinyl, drumsticks, vintage clothing and paperback books, they create monumental artworks that commemorate historical figures, cultural practices and current events. Los Angeles-based artist Diedrick Brackens incorporates mixed-media materials into his textile-based practice. In the Ulrich Museum of Art’s Grafly Gallery, Brackens will showcase 10 new weavings that explore issues of human engagement, self-care, boundaries and preservation. Exploring themes related to ideas of space and place, this exhibition showcases new acquisitions from the Ulrich Museum of Art’s permanent collection. Highlighting works from emerging and established international artists based in countries that include the United States, Canada, Australia, Brazil, Austria and the United Kingdom, the installation will feature works in video, sculpture, photography and printmaking. All of the above – except for the Ulrich Museum, which is always free – participate in Visit Wichita’s Explore Card discount program. You pay full admission for each ticket at the first attraction you visit, then you receive an Explore Card that you can use to receive a $2 discount for each ticket purchased at the other participating attractions through Dec. 31. The card is free and available at the attractions or at Visit Wichita’s office, 515 S. Main, from 8 a.m. to 5 p.m. Monday through Friday. Click here to see all of the Explore Card participants.